How Do We Build our Geeky Book Quote Library? I took a moment to use Vine to capture how we build our quote library of 800+ quotes from geeky books. 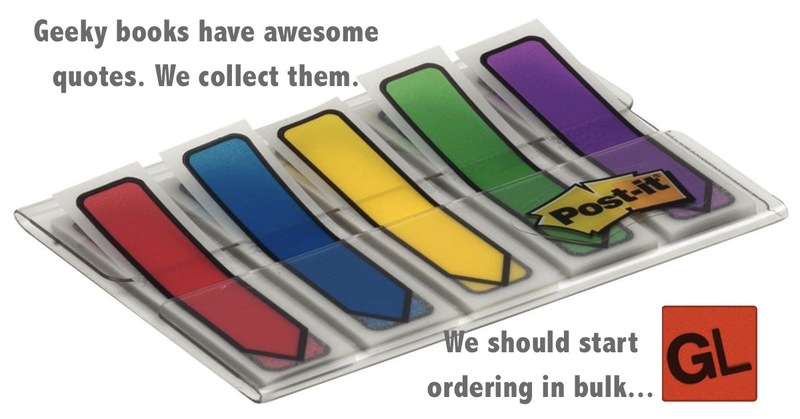 Currently our preferred method is to keep post-it note arrows close by while reading and use them to mark the spot. We enter them into our searchable database later to be used on Twitter or for other purposes. The geeky book quotes we collect are awesome too… we just go through a lot of post-it arrows. I generally enter quotes in as I review them, so this also is a sneak peak of some books we plan to review soon. Now, if you’ll excuse me, I’ve got to go enter quotes into our quote library.